I know that this is predominantly a food blog, but I have recently started on some DIY projects for the new nursery and I am just having so much fun in doing it that I couldn’t help sharing and hopefully provide some ideas and inspiration for any other mums out there. I have come across some really nifty tricks and tips and the realisation that making your own things needn’t be hard nor scary. When we found out that we were having a boy, we were ecstatic to finally know. It made such a big difference now knowing what was growing inside, not only because this new-found identity brought so much happiness and fulfilment but it also meant that all the nursery planning could commence! We were in a baby store that first weekend after finding out looking at ideas for nursery themes and bedding. However my excitement was short lived as we started looking at the prices and seeing some cot sets cost upwards of $250, just for the bedding! And to damper my excitement even further, I didn’t see anything I loved. This was pretty much the same story at subsequent visits to a few other baby stores. It wasn’t the cost of things so much as just not being able to find anything that caught my attention and that I could picture in our nursery. Perhaps my expectations were just too high. So I thought to myself, why not me? Who says that I couldn’t have a go at making my own things for the nursery. So I sat down, decided that I am making as many things as what I am capable of making myself, and jumped onto Pinterest. Best thing I could have done. 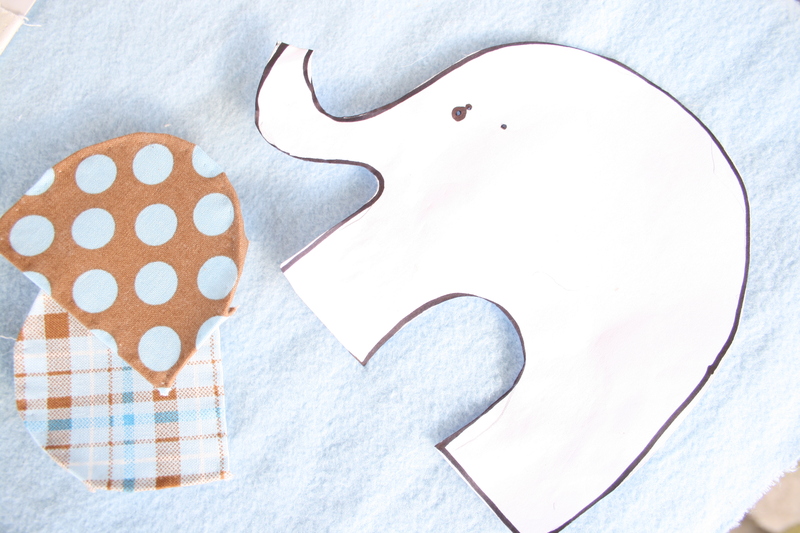 Slightly overwhelmed with the amount of ideas I came across, we narrowed the theme down to our top three choices and then decided on a Baby Elephant theme. I feel that I should mention that I have very limited knowledge about sewing. The last sewing project I took on was a t-shirt I made in Home Economics about 16 years ago. Which was everything except a raging success. My poor mum (who used to be a Home Economics teacher herself) tried in vein to teach me all about sewing when I was younger. The thing was, I never saw the point in making clothes when you could just go out and buy them. Silly me should have listened as it turns out sewing machines don’t just make clothes…But I digress, what I am trying to say is that I am no expert, and I would rate my skill level as ‘beginner’ at best, but if there was a prize for determination I would win first place every single time. So everything I am attempting I do so with pure determination and with the help of my new best friend – YouTube how-to videos. So if I can do it, so can you! 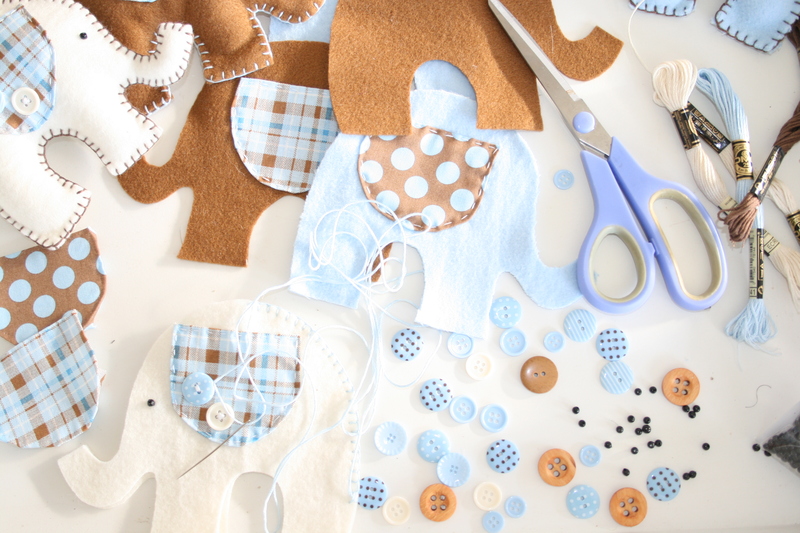 I started thinking about colours, and I’ve always loved brown and blue together, so after the first of many trips to my local craft store I made up my mind about baby blue, brown and cream for the colour scheme. 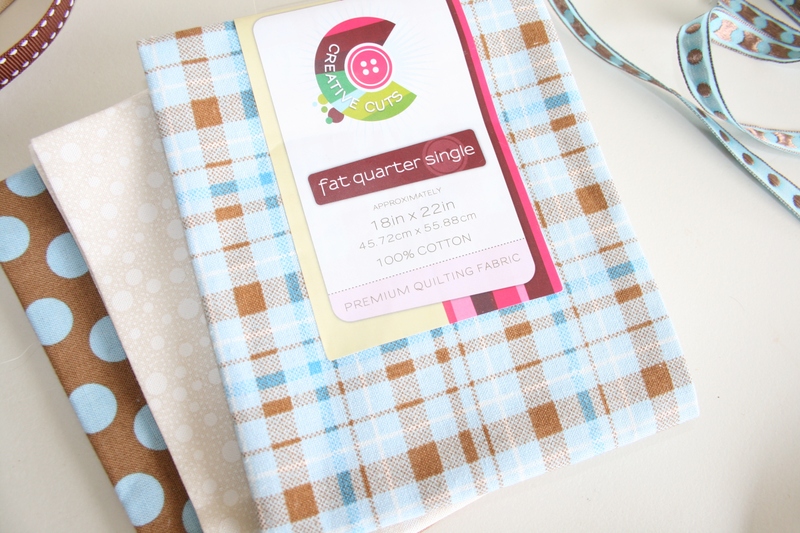 Tip: I started in the quilting section of the craft store by looking at those small individual quilting blocks and picked out three for the base of my colour scheme. It is a great place to start for some colour inspiration as there are literally hundreds of different colours and patterns to choose from. 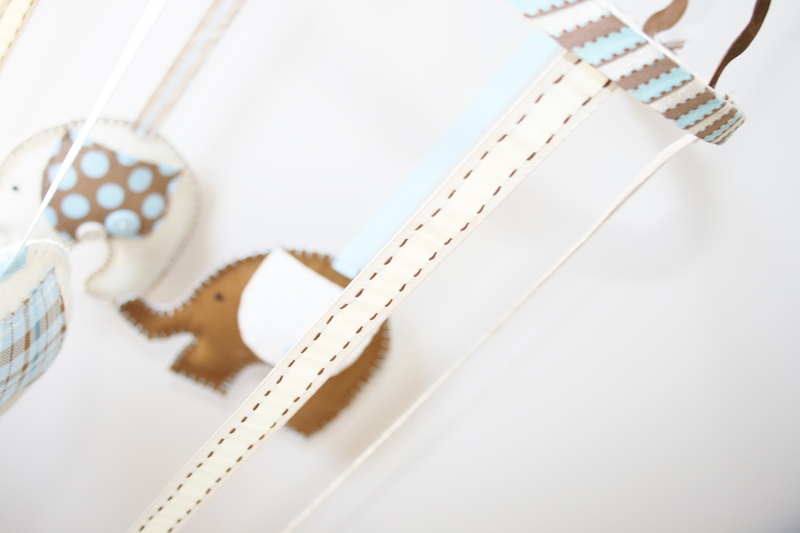 Next came deciding on the first project, and making a mobile for the cot sounded easy enough to start with. So on to a Google Image search I went to look at some ideas of what was out there and where to start. 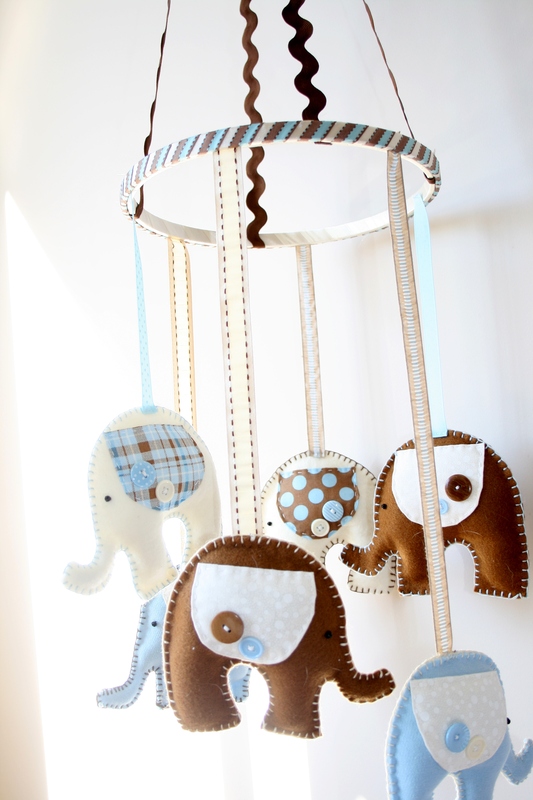 Following are just a few directions on how I made my baby elephant mobile, but it should be easily adaptable to any shape or animal you decide on for your own mobile. 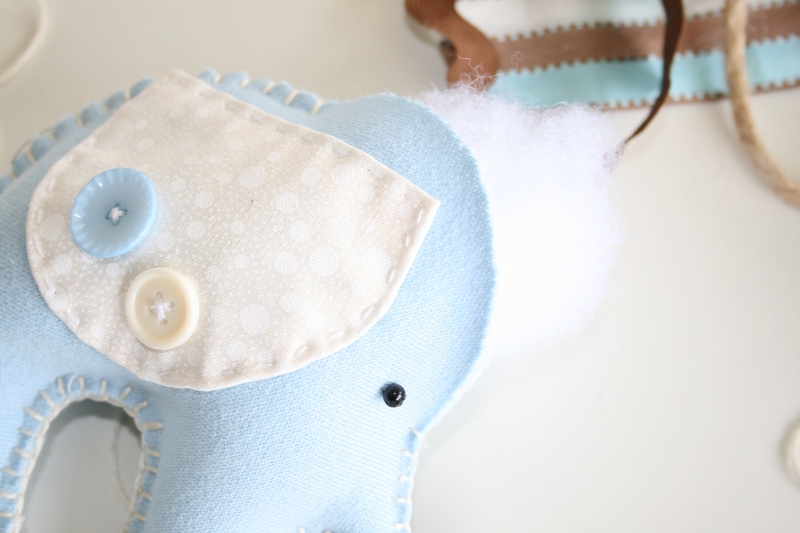 Tip: I started off with a practice elephant, trying different things and practising my stitching, it really helped take off the pressure of making that first one and not wanting to mess it up. I started on drawing some elephant shapes to decide on how I wanted it to look and what size I wanted it to be. I then cut the one out of paper I liked most and traced it on all my felt sheets with a pencil. I cut out six pairs of elephants, so ended up with twelve individual elephants ready for their decoration. I used felt for my elephants as it is quite sturdy and it doesn’t fray around the edges so was perfect for the type of stitching I used. (Except for the blue elephants, I couldn’t get the exact shade of blue I wanted so I used a different fabric, so if you can’t find your colours in felt, try any other sturdy fabric). 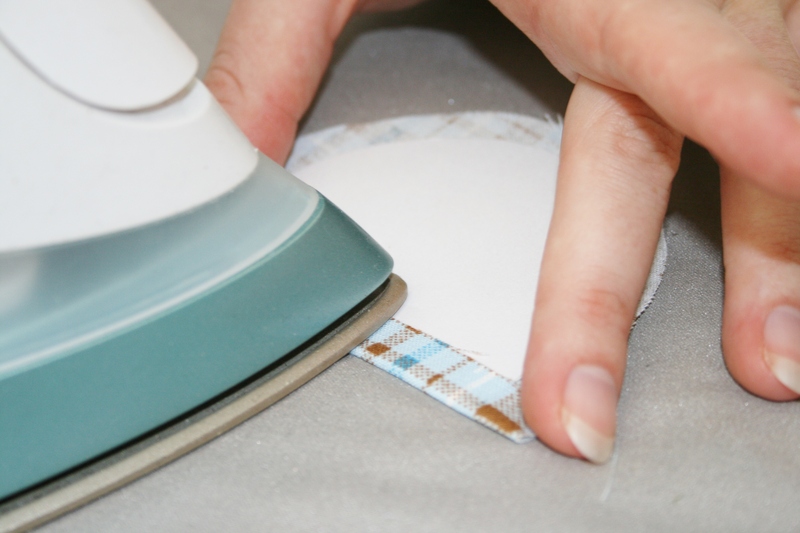 Tip: I folded each A4 sheet of felt in half before cutting out the shape, that way each pair that is being stitched together will be perfectly aligned. I made the ears by again cutting out the shape I wanted, this time on a small piece of cardboard. 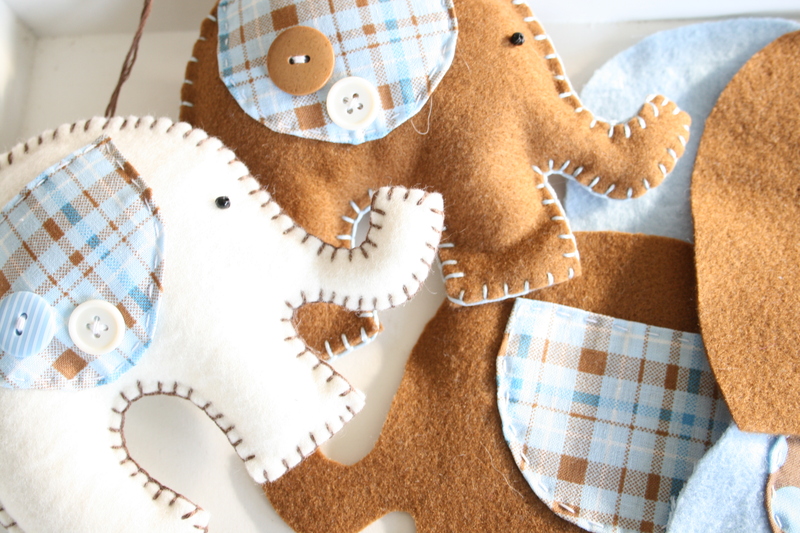 I used the three quilting blocks of fabric I picked out to mix and match it with the twelve elephants I had cut out. 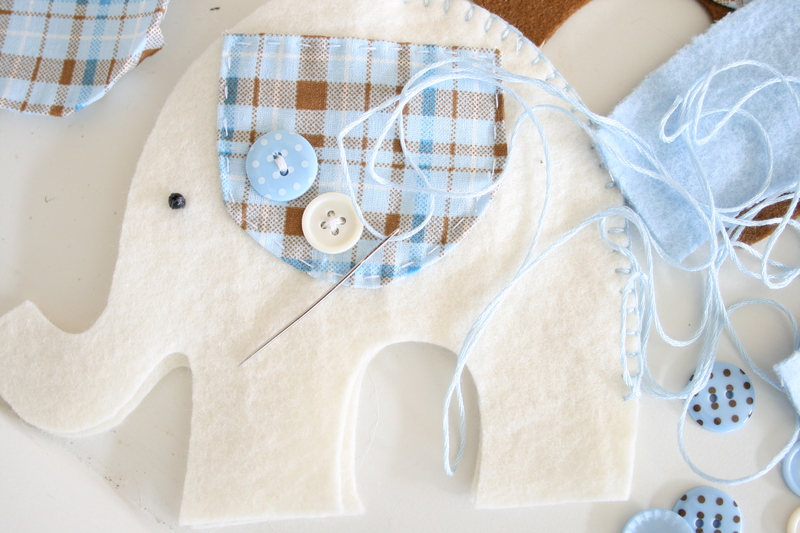 I had cut out two ears to stitch on to my practice elephant and after stitching the first ear I noticed that the quilting fabric was fraying slightly around the edges, and always the perfectionist, this was not going to sit well with me. So I cut out each ear approximately 1cm wider than the actual size of the ear I wanted and then ironed in a fold around the shape of the cardboard cut-out ear to create a clean and tidy border. I used small black beads and simply stitched it to each elephant (before starting to stitch the pairs together). But you could use a black felt tip and draw on an eye or black thread. 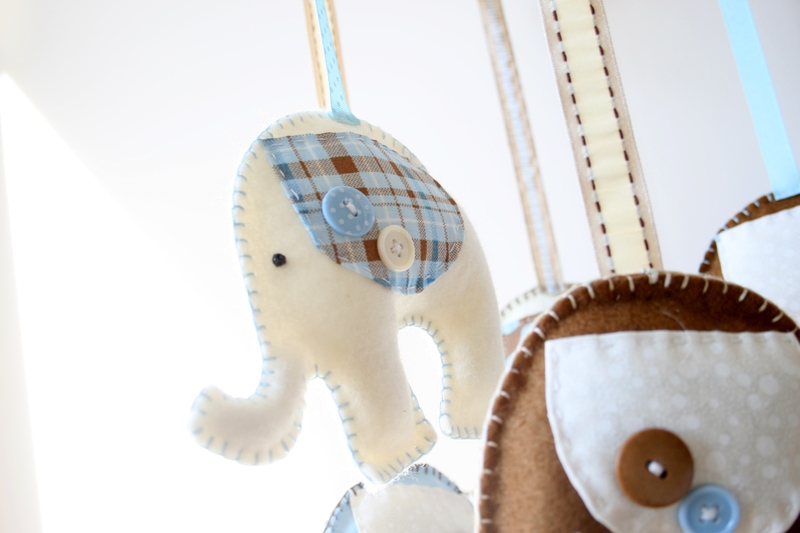 After a Google search of “how to make a crib mobile” one of the things I found out was the stitching that I ended up using around each elephant is called blanket stitching. I have always been quite fond of that type of stitching that I’ve seen around but naively thought surely only a machine can produce that. Turns out it is one of the easiest things to do! I watched this YouTube video to learn how. The stuffing is entirely optional, it would look nice without it as well, but it also gives a nice three-dimensional look. 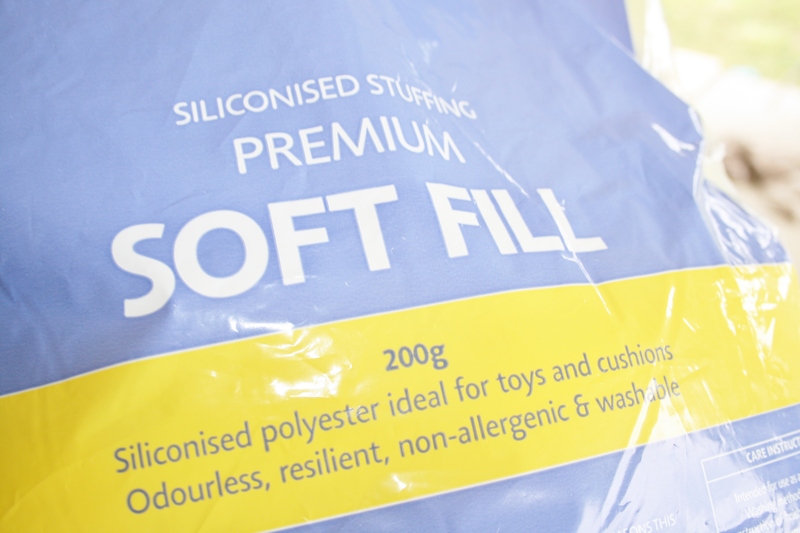 I found a bag of Soft Fill (which is siliconised stuffing) at the craft store which was perfect for the job. But I imagine that you could also use something like cotton wool to achieve the same effect. I stitched each elephant about three quarters of the way, starting just above the trunk and moving clockwise so that there is an opening on the head. From there I took little bits of the soft fill at a time and started stuffing the trunk and each leg then the rest of the body before stitching it shut. Tip: to get the soft fill down the trunk, I used a pencil to push it down all the way. 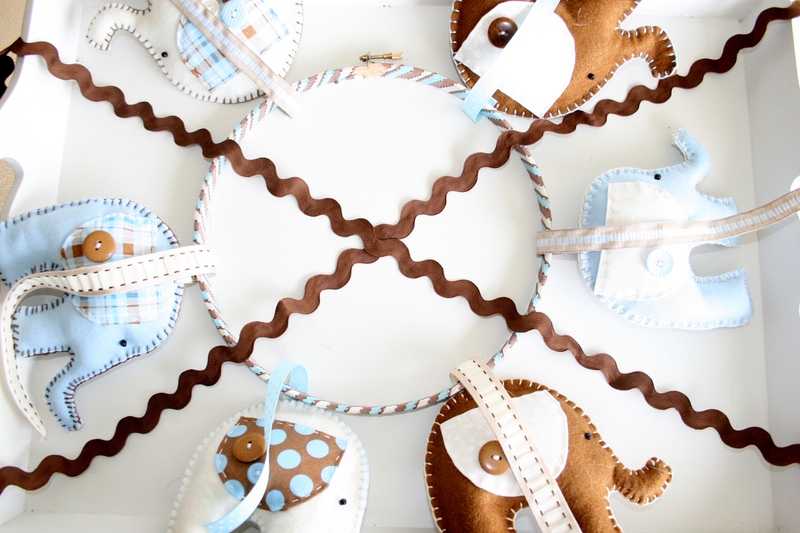 I used an embroidery hoop to hang all the elephants on (but you can any type of cross-bar or round hoop). 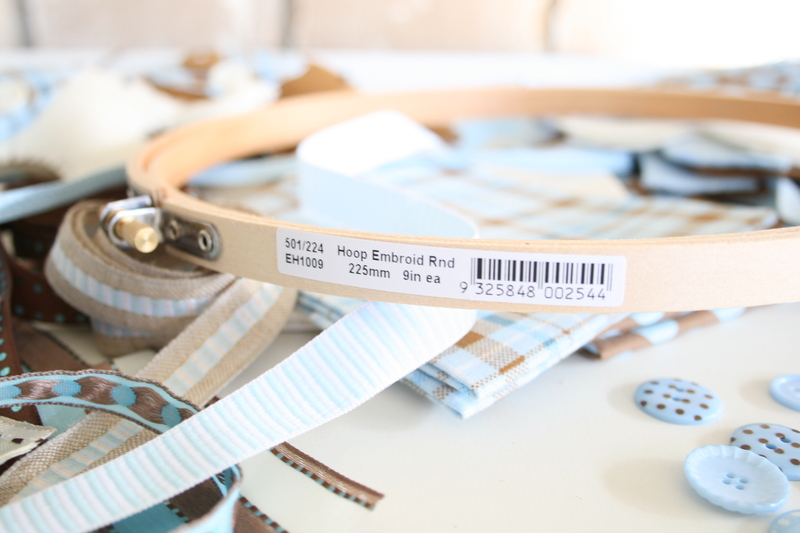 What I like about using the embroidery hoop is that you can loosen the outer hoop and thread all the ribbon through and tighten it again to firmly secure each hanging elephant. And it only cost around $3.50 to buy (I got mine from Spotlight). I covered the inner and outer hoops with ribbon and then positioned all the elephants where I wanted them to hang and secured the inner hoop by tightening it as far as it could go. I had a hard time picking out ribbon, only because I saw way too many that I liked and ended up buying a few more different types than what I needed. But they will definitely come in handy in some of the other projects I have in mind. So to wrap this up, I would rate this project as fairly easy to make, but I will say that it was time-consuming. Each elephant took about two to three hours to make, but was overall a very enjoyable experience! So very creative and cute! Thanks for sharing. This is SO precious! Love all the detailed photos. ~M.